“Nobody should be allowed to burn the American flag,” President-elect Donald Trump tweeted at five minutes to six on the morning of November 29. “If they do, there must be consequences—perhaps loss of citizenship or year in jail!” The statement shocked many, chiefly because the incoming president’s opinion is at loggerheads with established law: in 1990, the US Supreme Court ruled that laws banning flag desecration are unconstitutional, and in 1967, the court ruled that the government cannot strip citizenship from US citizens. Someone well-versed in these laws is artist Dread Scott. As a student at the Art Institute of Chicago in 1988, he created an installation piece called What is the Proper Way to Display a US Flag? 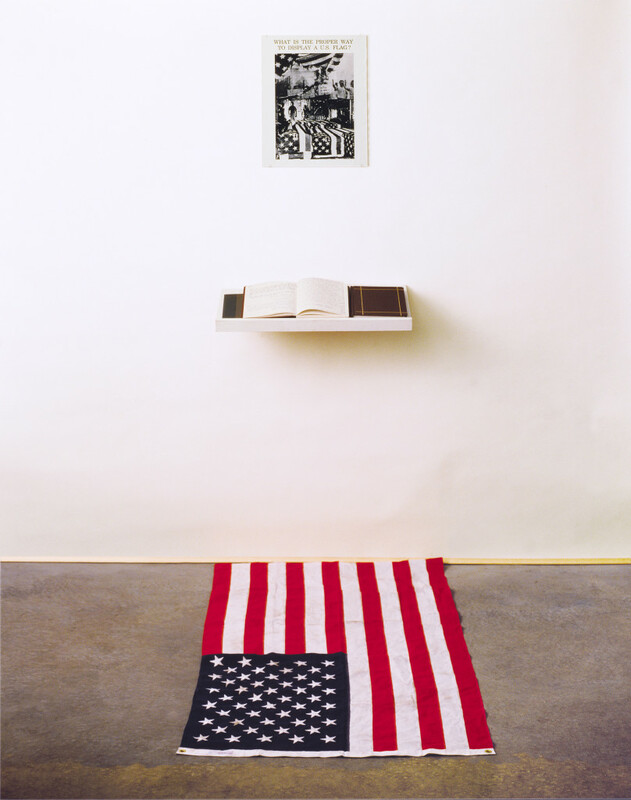 It consisted of: a photomontage hung on the wall showing images of photo of flag-draped coffins and a shot of South Korean students burning US flags; a shelf with a blank book in which visitors could respond to the work’s titular question; and, on the floor beneath it, an American flag that visitors could walk on to write in the book. 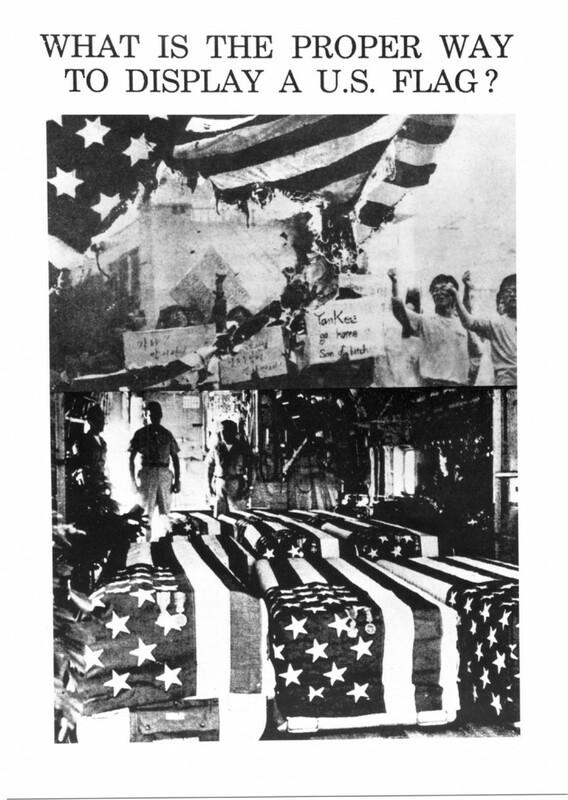 Called “disgraceful” by then-President Bush, the work prompted legislators, nationally and in Chicago, to propose laws banning such use of the flag—all of which became law. One, the “Flag Protection Act of 1989,” prompted Scott and others to burn flags on the US Capitol steps in protest. We invited Scott—author of a Walker Artist Op-Ed on the police killing of Michael Brown and an artist featured in the Walker’s 2014 presentation of Radical Presence—to share his reaction. In 1989 I, along with others, burned flags on the steps of the US Capitol in defiance of the “Flag Protection Act of 1989,” which in part contained wording intended to outlaw my artwork What is the Proper Way to Display a US Flag? In the resulting Supreme Court case, the Court ruled that flag-burning is constitutional. With his tweet, Trump is issuing an edict that this ruling should be overturned and people should be punished for this kind of dissent—stripped of their rights to become stateless people. The American flag flew over the Supreme Court that issued the Dred Scott decision that stated that a Black person “had no rights which the white man was bound to respect.” It was carried by the cavalry that committed genocide against Native American peoples. It is worn by the cops who killed Eric Garner and countless others; it is painted on the drones that kill people in Pakistan and worn by the sheriffs and Army of Corps of Engineers soldiers who are attacking the water protectors at Standing Rock. Trump has promised to conduct mass deportations, force Muslims to register in government databases, torture families of suspected terrorists, and impose “law and order.” He has surrounded himself with neo-Nazis, climate-change deniers, Christian fundamentalists, and robber barons who with official power aim to eliminate access to abortion, seal borders, and expand wars. And he has unleashed a core of angry white people with a lynch mob mentality. As he does this, he is declaring that fundamental critique of America and the government won’t be tolerated. In the face of this, I hope that there are many more flag burnings. His proclamation should be defied as part of people demonstrating that we will not accept a fascist America. Some have argued that Trump’s tweet about flag-burning is a distraction from the real issues, like who he is appointing to his cabinet or his conflicts of interest. Believing that this is a distraction is dangerous logic that would end up accommodating Trump’s fascist program. His response to Colin Kaepernick’s courageous refusal to stand for the national anthem was to say, “he should find a country that works better for him” (people have often made this suggestion to me as well). Historically, fascism has required extreme nationalism and created sections of people who have no rights. Fascism suppresses dissent. Trump is targeting protest—and, specifically, protest that challenges national cohesion. In the Führer’s new America, actors, athletes, and others with a public voice are told to fall in line. It is no accident that he has targeted the extremely popular musical Hamilton because the audience righteously booed Mike Pence’s presence and the cast called out his bigotry from the stage. Trump has bullied and threatened the press, and many are normalizing his rule. Far from being a distraction, when Trump bellows that people who burn American flags should lose all rights, people should rise to that challenge in the same spirit that many who knelt with Kaepernick did. This needs to be done as people build an overall resistance to Trump’s attempt to consolidate his fascist rule. This spirit needs to infuse our action, and I encourage people to read the whole statement as we confront the severity and the enormity of the problem we face. Now is the time. People need to get outside of their comfort zone and act with courage as if the future depends on it—because it does. My artwork, Imagine A World Without America, seen on the cover of the November issue of Artforum magazine, encourages readers to do what the title says. It is an important perspective that asks people to consider what the world could be without the profound influence of everything that is America. With fascist movements across Europe emboldened by Trump’s win, it is important to consider what the world could be without the profound influence of America. Art and ideas that encourage people to stand up to petty tyrants who try to impose horrors on humanity are needed now more than ever.